Independent Research & Development (IR&D) is a technical research and development effort by industry that is not sponsored by, or required in performance of a contract. It consists of projects that are within the areas of basic and Applied Research & Development and other concept formulation studies. Contractors are permitted to recover a portion of their IR&D costs by including them as an allowable indirect expense on government contracts to the extent that those costs are allocable and reasonable In addition, DoD permits major defense contractors to include allowable IR&D costs as indirect expenses on defense contracts to the extent that the IR&D activities are of potential interest to DoD. Enable superior performance of future U.S. weapon systems and components. 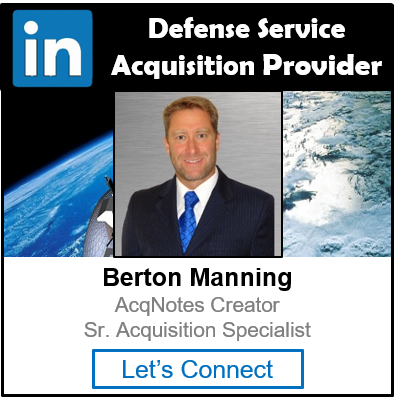 Reduce acquisition costs and life-cycle costs of military systems. Strengthen the defense industrial and technology base of the United States. Enhance the industrial competitiveness of the United States. Promote the development of technologies identified as critical under 10 U.S.C. 2522 “Armament retooling and manufacturing”. Increase the development and promotion of efficient and effective applications of dual-use technologies. Provide efficient and effective technologies for achieving such environmental benefits as: improved environmental data gathering, environmental cleanup and restoration, pollution reduction in manufacturing, environmental conservation, and environmentally safe management of facilities. Public Law (10 USC § 2372) Section 802 of the National Defense Authorization Act for Fiscal Years 1992 and 1993 (Public Law 102-190, December 5, 1991) provides for payment of independent research and development and bid and proposal costs under defense contracts. Federal Acquisition Regulation (FAR) 31.205-18. This regulation provides the contract cost principles and procedures for IR&D and B&P costs under government contracts, including: definitions of IR&D and B&P costs, cost allowability, deferred IR&D costs, and cooperative arrangements. Defense Federal Acquisition Regulation Supplement (DFARS) 231.205-18. This regulation provides the contract cost principles and procedures for IR&D and B&P costs under defense contracts, including: definitions of covered contract, covered segment, and major contractor; cost allowability; and a list of activities that are of potential interest to DoD. For major defense contractors, allowable IR&D/B&P costs are limited to those for projects that are of potential interest to DoD. The cognizant administrative contracting officer (ACO) or corporate ACO determines whether the IR&D/B&P projects are of potential interest to DoD. Defense Federal Acquisition Regulation Supplement (DFARS) 242.771. This regulation provides the contract administration functions relating to IR&D and B&P costs incurred by major defense contractors, including the responsibilities of: the cognizant ACO or corporate ACO, the Defense Contract Management Agency or the Military Department responsible for performing contract administration functions, and the Director of Defense Research and Engineering. Cost Accounting Standard (CAS) 420. This regulation provides criteria for the accumulation and allocation of IR&D and B&P costs to cost objectives based on the beneficial or causal relationship between such costs and cost objectives. The Defense Technical Information Center (DTIC) collects and maintains thousands of IR&D project summaries submitted by defense contractors in a restricted-access database. The database contains a short description of each IR&D project and a contractor point of contact. Contractor submissions are voluntary, but most major defense contractors provide project information. The IR&D database offers contractors a means of publicizing technical capabilities to potential DoD customers.